After the first relatively unsophisticated Google MapSpam bulk upload attempt became public, I had a long and interesting conversation with a webmaster who had spent many years implementing a “long tail search” campaign on behalf of local business in a major market. He pointed out that with a little bit of work, a national company could easily localize its website with optimization on the “location + service” phrase in any city desired. As I noted to him, it wouldn’t be that big of a deal to get a local post office box or centralized address in any city, “legitimizing” itself, and achieving a reasonable ranking in Google Maps. The company wouldn’t even need to “make up the address,” as some enterprising spammers did in the Yahoo MapSpam case I wrote about earlier. I even contemplated (for all of 30 seconds) what the web site a business offering a mailing address and forwarding information would look like. Well, it didn’t take long for someone to put the pieces together and create more a sophisticated MapSpam strategy that is much harder for Google and Yahoo to detect. This would work particularly well in any industry that supports an affiliate model where the order taker/lead finder gets paid, as the website owner needs no inventory or specialized knowledge and is essentially reimbursed for providing the order/application. 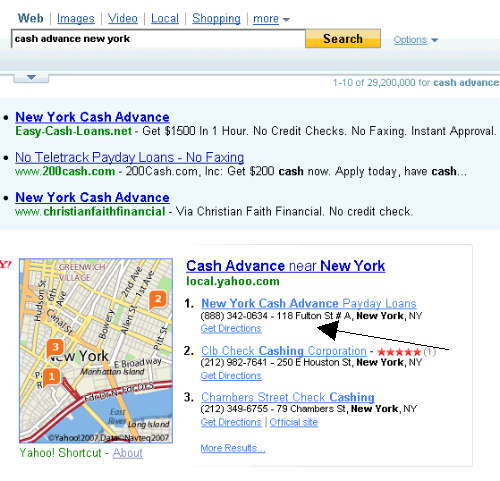 In this example, the business in question (Payday Cash Advances) has created listings with Yahoo Local and with Google in every major market that have been authenticated in Google’s Local Business Center and optimized for Local OneBox placement as well. While it appears that this practice might be illegal in a number of states, Google to date has provided no forum for reporting, let alone resolving these incidents. As Greg Sterling pointed out, get rich quick schemes at some level validate the benefit & reach of an advertising product. If it is worth bending the rules to achieve enough profit, someone will do so. If that is the measure of success, then apparently Google Maps has come of age. One can also surmise from this example that Google Maps has penetrated the lower incomes levels of our society. The Whois record indicates that the IP address for NewYorkCashAdvancePaydayLoans.com is 64.59.105.53 located in Auburn Hills, MI. Whois record indicates that the IP address for BuffaloCashAdvancePaydayLoans.com is the same, 64.59.105.53 located in Auburn Hills, MI. To Ask.com & Microsoft’s Live Search’s credit, these listings were not visible front and center on their main results pages. This might be explained by a better local algorithm or perhaps an ROI calculation on the part of the spammer that the reward is just not worth the effort. Mike Blumenthal is a student of life, political economy and local search. He writes the blog Understanding Google Maps and Yahoo Local Search and is a partner in a small web design company in upstate NY.